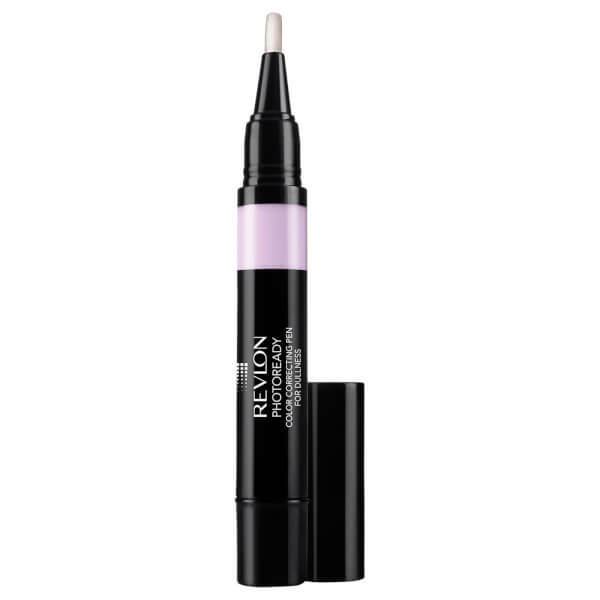 Brighten your complexion with the PhotoReady Color Correcting Pen for Dullness from Revlon. The lavender-tinted formula is enriched with 3D Colour Correcting Pigments and High Definition Filter Technology, which work to capture light in order to blur the appearance of imperfections. Housed in a precision pen for quick and targeted application, the colour corrector helps to banish sallowness and create a clear, balanced and radiant complexion. Turn base and apply to specific sections of your face to correct dullness and sallowness. Aqua/Water/Eau, Dimethicone, Isododecane, Trisiloxane, PEG/PPG-18/18 Dimethicone, Boron Nitride, Butylene Glycol, Trimethylsiloxysilicate, Bis-PEG/PPG-14/14 Dimethicone, Methyl Methacrylate Crosspolymer, Phenyl Trimethicone, Sodium Chloride, Tribehenin, Glycerin, Isodecyl Neopentanoate, Cyclopentasiloxane, Disteardimonium Hectorite, Silica Silylate, Silica, Dimethicone/Bis-Isobutyl PPG-20 Crosspolymer, Triethoxycaprylylsilane, Methicone, Calcium Aluminum Borosilicate, Propylene Carbonate, Sorbitan Sesquioleate, Tocopheryl Acetate, Hydrogen Dimethicone, Methoxy Amodimethicone / Silsesquioxane Copolymer, Tetrasodium EDTA, Phenoxyethanol, 1,2-Hexanediol, Caprylyl Glycol, Titanium Dioxide (CI 77891), Mica, Ultramarines (CI 77007), Chromium Oxide Greens (CI 77288), Iron Oxides (CI 77491, 77492, 77499).